November 17, 2016 by Nils Oudhuis . Greg Lehman is a practicing physiotherapist, chiropractor and dabbler in research. He is clinical educator teaching Reconciling Biomechanics with Pain Science and The Resilient Runner Workshop. Greg believes that biomechanics is often important for rehabilitating pain and injury but it should fit and not conflict with concordant treatment within the biopsychosocial model. You can find his website here and follow him on Twitter: @GregLehman. Being a rehab professional can be both a source of pride and extremely humbling. We have a massive amount of research that can make us feel overwhelmed and daunted. We are regularly challenged by our patients and often surprised at our outcomes (both success and lack of success). There are many systems that are employed to treat patients and they are often conflicting in the advice they give therapists. To me those conflicts between systems and approaches should give us confidence. They suggest that different approaches can sometimes be successful and perhaps it is not the details of those approaches that create positive changes in patients but rather some other factors that are consistent across approaches. What I advocate is a simpler approach that encompasses many of the common factors across different therapy systems. We can look at the different techniques that exist and pull out the common and effective factors in those approaches and perhaps add other elements from different professions consistent with the biopsychosocial model. We don’t have to throw away a biomechanical approach rather I’d argue that it can be greatly simplified. This simplification allows the therapist to develop new therapy skills to address the multidimensional nature of pain. I would consider that my style of practice falls consistently under the Cognitive Functional Therapy (CFT) approach to pain and injury management. It might feel difficult to start treating in the BPS model. 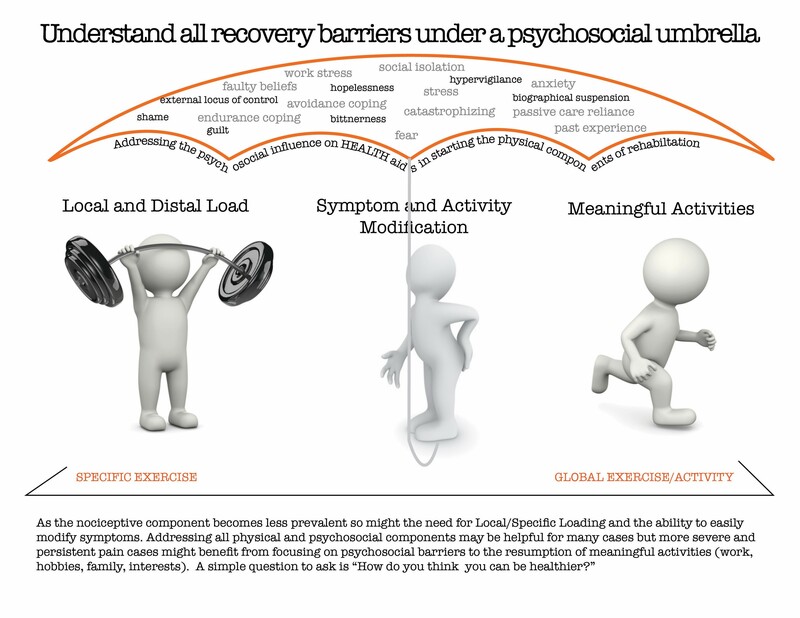 One simple way to start using this model is the application of pain science key messages. 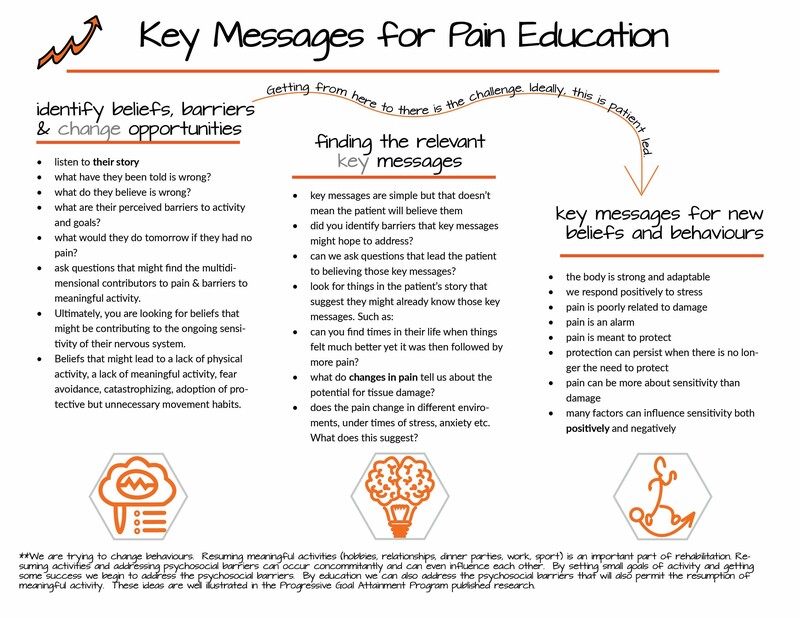 Meaning, don’t just throw “Explain Pain” at your patients and hope that something sticks. Don’t just explain the role of every neurotransmitter, nociceptor, smudged cortical body map and “brain beat” your patients. Rather, try to find key messages that are relevant to a patient’s predicament. Perhaps there is a key message or series of key messages that lead to behaviour changes or even facilitate the effectiveness of your treatment. Perhaps education changes expectations and these changes again promote the effectiveness of other more mundane physical approaches to rehab. addressing those beliefs. It is assumed that those faulty beliefs somehow lead to movement or health behaviours that continue to sensitize the person. The most famous example would be a patient’s belief that their spine is damaged and inherently unstable. Therefore, they fear movement, bending and constantly stabilize their spine. They withdraw from social activities they like, they become hypervigilant and they have diminished expectations for their recovery. These beliefs lead to behaviours that might continue to sensitive their system. Choosing and applying the appropriate pain science key message might facilitate behaviour changes that are healthier. An appropriate key message here would be that the body is strong and robust. It is inherently adaptable, meant to move and meant to be stressed. Changes on MRI are poorly related to pain and even if “damage” exists it is the physical stress/load placed on damaged tissue that facilitates adaptation and tolerance. But this isn’t easy. You might have to slowly unpack the beliefs people have and then slowly their opinion might change. Your skill is in changing that opinion. It is not as easy as just saying the key message. It is getting them to somehow feel and believe that key message. These aspects of communication and behaviour change is where we can all improve. Perhaps, it is in this realm where your next continuing education course is. Do you need another course that explains how subtalar movement causes or theoretical causes 3D changes up the kinetic chain? The point of simplifying the biomechanical component of treatment is to allow us to improve our skills in developing and implementing these key messages. Below is schematic of an overall treatment approach. There are plenty of exceptions to this but let’s go through it. Remember, it is a schematic or framework that can be fleshed out with better evidence and different approaches. Psychosocial factors cast a shadow over everything we do. They are always relevant to some extent with all of your patients. Even a sprained ankle can benefit from explaining the relevance of pain and addressing the beliefs that your patients have about injury. We don’t always have to change the psychosocial factors but we should identify and acknowledge them. Where a difficulty lies is determine when or if we HAVE to address a psychosocial factor. This might occur and might demand a referral to another professional. Meaningful activities helps people resume their life: Addressing and understanding the psychosocial factors can help with the physical treatment on the right…meaningful activities. Meaningful actives are essentially those things in a person’s life that make them them. Those things that are important that have been neglected and aren’t being done. Social activities, sports, playing with their kids. The assumption is that we can start doing those things without the need to FIX something previously. That the act of resuming the things that are important is a huge part of therapy. Sometimes, it is just starting these things that is helpful. Other times, you might have to address the psychosocial barriers that would stop meaningful activity or might lead to continued sensitization that makes meaningful activity painful and distressing. For example, I work with a lot of endurance athletes with persistent pain. Almost all of them can start running again to some extent. If you think that treatment is more about facilitating rather than fixing then this approach makes sense. I don’t have to change some imaginary dysfunction related to “talar” dysfunction before they can start running. Running becomes the rehab. We expose them to running loads and ask that the body and person adapt. This is facilitated by education and other treatment. Specific Exercise – local and distant load: Simplifying biomechanics involves specific exercise. With many cases just basic specific joint loading is helpful for pain and function. A slow progression of load that addresses all biomotor abilities can be helpful (comprehensive capacity). An example, would be patellofemoral pain syndrome. We do not have to think about activating the VMO or chaining the firing patterns of the Gluteus Medius. This has not been shown to be more effective than simple, progressive loading at the level of the knee and at the level of the hip. Thus we load locally and at distant and this can be effective. You don’t have to change kinematics or think that you are training firing patterns. The evidence for those ideas is sorely lacking but the evidence for simple exercise progression and load is certainly stronger (no panacea mind you). The simple load would be coupled with possible symptom modification techniques and the resumption of meaningful activities in a slow and graded manner. Symptom and Activity Modification: Its OK to avoid things sometimes. It might hurt to raise your arm over your head in a certain way. Often you can make a modification to that movement…not based on proposed ideal scapula kinematics but rather merely on a change in symptoms. This can be helpful to allow someone to continue to do their meaningful activities and allows for the application of load that we might consider to be important in rehab. Another example would be painful spinal flexion. Sometimes its appropriate to avoid it for the short term. To allow the person to desensitize. But we don’t say that spinal flexion has be be avoided forever. We perform the movement modification and then slowly expose someone to the once painful movement to take advantage of the person’s ability to adapt and tolerate. Name brand techniques that fit into this classification would be Mobilization with Movement or Mechanical Diagnosis and Therapy. You find something that hurts, then you change something and then you keep doing the once painful activity as long as symptoms have been modified. We don’t need some arbitrary arthrokinematics or assumed movement ideals to choose the “correct” way to move. It is symptom based and those modifications that are important. Meaningful movements: this is often the most important in my opinion. It is the idea that the thing that is most important to someone becomes their rehab. If someone is a rock climber with shoulder pain we can keep them rock climbing. A key message is that the body adapts to the stress on it. Rock climbing can give that stress. We don’t need to fix serratus anterior firing patterns or scapular kinematics. We recognize that movement preparation trumps movement quality. The rocking climbing with proper progression, coupled with the other treatment components, is the therapy. This is a fun and optimistic way to practice. A nice question to pose to yourself is whether we fix versus facilitate. This approach above is really about slow graded exposure to activities with the assumption that the person can adapt and desensitize. It assumes the adaptability potential of the person. So we have to question whether that adaptability exists and consider if there are cases where the demands on the person exceed that adaptability. In these cases other treatments might be necessary. It might be hard to adapt to a compound fracture or dislocated shoulder for example. Or, can we always adapt to a disc extrusion that presses on a nerve root.? Can every rotator cuff tear be tolerated? Do specific psychosocial factors NEED to be addressed? This model recognizes that sometimes things do need to be FIXED. So our challenge is making those clinical decisions. It is not easy but it makes it interesting. We treat with the best knowledge we have. We all try and we all care. There are many different approaches and I think many could fit into this approach or categorization. What is interesting is that perhaps no approach is ever necessary and must be done. If this is true it gives us options and a greater potential to help our patients. It also allows us some tolerance of those who practice differently. That being said, I will leave you with one clinical question to consider. Do you ever think there are specific patient cases where something specific must be addressed with one specific intervention in order to achieve pain resolution and successful rehabilitation? Its a great question to ponder and if we knew the answer we would probably be a lot more successful in our treatments.